Taste test: We're big fans of hot chips here at Taquitos.net, and it's hard to classify these because the heat level varied quite a bit from chip to chip. 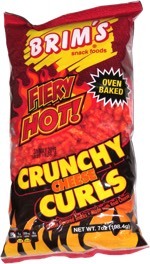 Some chips were quite hot, while others didn't seem to have any heat at all. 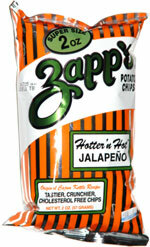 Zapp's makes a nice, tasty, crunchy chip and cooks them in peanut oil, but apparently they haven't figured out how to get the flavor onto all of the chips. Smell test: Intense jalapeño smell, fairly hot. Made my mouth water a little.